Photo courtesy of the Preservation Trust. One of the most beautiful and perhaps the most imposing of the Vineyard’s old houses is to be presented by its present owners, Mr. and Mrs. Martin B. Faris of East Chop and New York, to the Martha’s Vineyard Hospital, whose trustees voted last week to accept this handsome gift. The house, which stands on main street, Edgartown, next to the Methodist Church, has long been known as the Butler house, although before that it was the Dr. Fisher house, and after that the summer home of Mr. Faris’ parents, the late Mr. and Mrs. William D. Faris, who called it Fanwilton. There was originally a house between this structure and the Mellen house, occupied by Dr. Daniel Fisher and torn down when he built the present Faris house. Between this house and the church stood the residence of the late Capt. James B. Huxford. 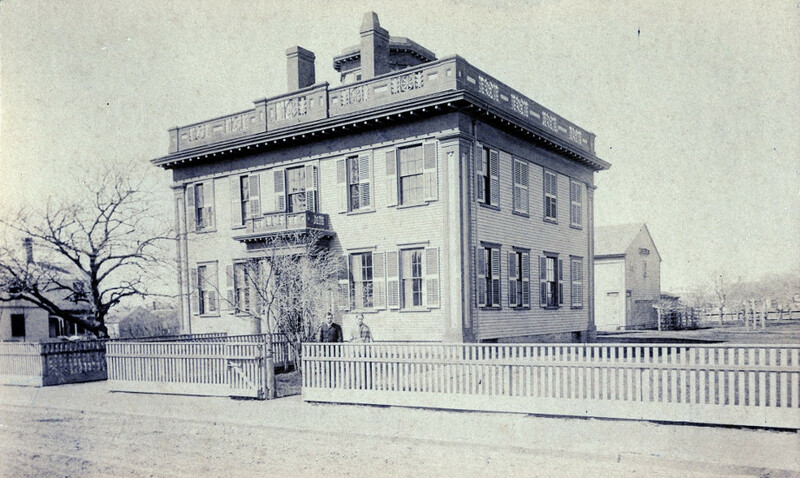 When William M. Butler purchased both properties, he moved the Huxford house to a site near the Harbor View, for which it became an annex. The frontage of the Faris house includes the three sites. Dr. Daniel Fisher, who built the house, was an Edgartown whaling magnate, owner of the largest candle works in the world, and of wharves, ships, mills and land. A friend of Daniel Webster, he was often host to distinguished visitors and entertained them at the great house which is the Vineyard’s best example of Georgian architecture. The property was purchased after Dr. Fisher’s death by William M. Butler, who became United States Senator and chairman of the Republican National Committee. He made extensive improvements to the house and landscaped the grounds, which stretch through from Main street to Pease’s Point Way. Mr. Butler was an Edgartown summer resident for many years, and one of the leaders in the building of the Wintucket water system and other public improvements. More than twenty-five years ago, he purchased first Windy Gates and then Mohu, at Lambert’s Cove, which he developed into a fine estate. Mr. and Mrs. Faris then purchased the Edgartown house for a summer home, and occupied it until a few years ago. It has remained empty except for short intervals since the death of Mrs. Faris. The house has been on the market for several years and is now to be added to the assets of the Island hospital. It is understood that it will be offered for sale. Mr. Faris told the Gazette that he felt sure the hospital trustees would see that the property, one of the town’s great assets, would be preserved.